A record of this dramatic encounter is cast in more than 3300 fossilised footprints at the Lark Quarry Dinosaur Trackways. 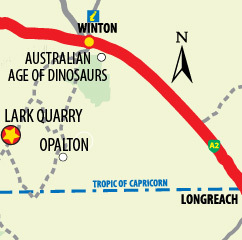 Lark Quarry, 120 kilometres south west of Winton, is currently the only recorded dinosaur stampede on earth. In this place, around 95 million years ago, a large herd of small two legged dinosaurs gathered on the banks of a forest lake to drink. 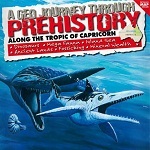 The herd was stalked by a large theropod – four tonnes of sharp-clawed, meat-eating dinosaur. The herd panicked, stampeding across the muddy flats to escape the theropod’s hungry jaws. 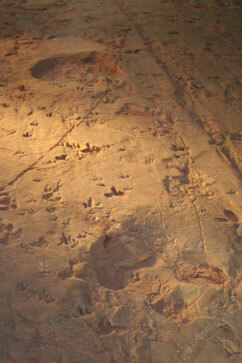 A record of those few terrifying minutes is cast in more than 3300 fossilised footprints. The footprints tell us about a cooler, wetter world, when dinosaurs roamed the earth and the mammal’s time is yet to come. Ornithopods were herbivorous dinosaurs found across all seven continents. They ranged from small chicken sized animals to beasts of 7-9 metres long. Some ancient animals survived extinction and can still be seen today. Crocodiles, turtles, and small bivalves have been found with the dinosaurs of the Winton Formation. These animals allow scientists to build a picture of the ancient land and seascape present 95 million years ago in Central Queensland. Visit the conservation park: Lark Quarry Dinosaur Trackways are conserved in an ecologically sustainably designed building in Lark Quarry Conservation Park. Visitors drive north from Jundah, or south west from Winton along a gravel road. For more information about activities in Winton head to the Waltzing Matilda Centre(Phone: 1300 665 115).